NOTE: The hose with the GREEN X is the main fuel line that goes to the carbs. Step 1) Remove completely the hose with the RED X. 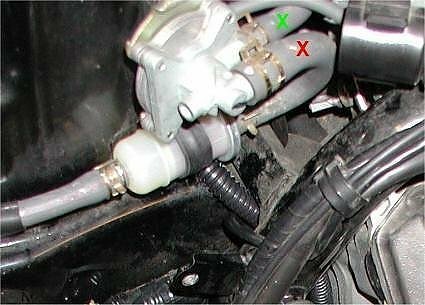 Step 2) Connect the hose with the GREEN X to the output of the fuel filter. Step 4) Plug the small vacuum line attached to the fuel cut-off. Link to kit at California Sport Touring.